are staying in their homes, healthy and independent because of your kindness. “I’m in a lot of pain,” Janet would say, when her health began failing and she was suffering. Janet was a Meals on Wheels client. She received hot meals daily, delivered by volunteers whom she considered her friends. Most days, she would sit in her comfy chair next to the typewriter and phone, rifling through old pictures and news clippings. When feeling inspired, she’d tap out a few lines of poetry or pen a horoscope. It was important to Janet that she remember her youth. To see how far she’d come. Though she was unable to do the things she used to, she was still able to live in her home and take care of herself. She took pride in that. “When I was young, I was very beautiful,” she would say. She was still beautiful. She had warm, compassionate eyes and a smile that could comfort the most vulnerable. 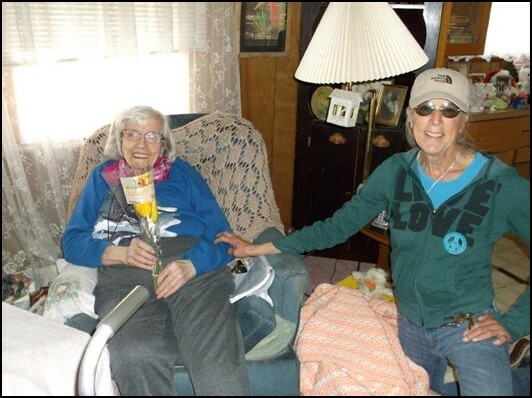 Though she had chronic health conditions that caused her to suffer, she was always smiling. She would leave cookies on the kitchen table for the volunteer kids who would come through the door. She was generous and kind. “I love you. You’re my guardian angels,” she said, a few weeks before she got very ill. She had grown close to a family of volunteers who came every Tuesday. “We love you too,” they said and meant it. The volunteers would hold her hand when the pain got to be too much. Janet passed away shortly after that. At the funeral, her daughter said that all they ever wanted was for Janet to live out the last days of her life in her home, with dignity and respect. She said Meals on Wheels of Albuquerque helped her mother do that. Thank you for helping families honor their loved ones’ wishes. We will miss Janet and feel lucky to have known her.